At the Qubet al-Ghouri cultural center in the heart of historic Cairo, the powerful voices of young munshids, or chanters, fill the air with praise and devotion. This is the collective voice of the Samaa Sufi Inshad troupe, the first of its kind. Driven by a desire to revive the waning tradition of inshad, or religious chanting, Entisar Abdel-Fattah, head of the Qubat al-Ghouri, formed the Samaa troupe in 2007. The troupe chants mostly Sufi lyrics in praise of God and the Prophet Muhammad. “Most of our music and theatrical works were inspired by folk heritage," explains Abdel-Fattah. As modern education becomes the norm, the influence of the Kuttab, or Islamic schooling, has receded. It was the Kuttab that had long represented the cornerstone of inshad instruction, after which Sufi religious orders stepped in to fill the gap. Abdel Fattah has set up a school for Inshad, along with another for Arabic Calligraphy. The troupe, Resalet Salam, or "Message of Peace," is another of his many artistic achievements. 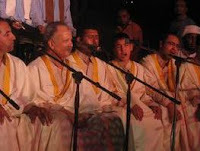 Abdel Fatah's music is a unique blend of Sufi inshad, Coptic hymns and Indonesian religious chants. Focusing on notions of peace and love, it incorporates religious musical styles from 12 different countries on five continents. According to Mohammed Omran, professor of Folkloric Music at Cairo's Arts Academy, the precise origins of religious inshad remain unclear. Some scholars believe the tradition first began with the Prophet Mohamed's disciple Belal, Islam's first Muazin, or caller to prayer. "In Egyptian folk culture, inshad can be of various themes, be they romantic, patriotic or religious," said Omran. At the beginning of the twentieth century, religious inshad were a combination of vocals and clapping. “Singers would knock their prayer beads against their canes for the tempo," said Omran. “Gradually, the tambourine and Oud were introduced, creating a musical ensemble now known as the goqa." He went on to explain that Munshids would often recite inshad as a method for learning tajweed, a rhythmic style of reading Quran aloud. Although the tradition has customarily been dominated by men, there have been numerous examples of female munshids. “The famous singing sensation Om Kalthoum was a case in point," said Omran, who went on to point to Damietta's Sheikha Shiha and Sharqia's Sheikha Tafida as other well-known examples. Listening to these powerful voices as they make their way heavenward, it is almost possible to believe in the possibility of a better world of peace and harmony.